Because we don't know him. He could be like Lebron and think the league owes him a ring as the chosen one, or he could be more loyal like Dirk. Dirk wasn't from here but he stayed here. I do agree that the Mavs need to sort out and build around him at all costs. That said, the Mavs have done anything in their power almost to a fault to help Dirk win another ring. A big part of Dirk staying here is Dirk, the other is Cuban and co and how they treat their guy. Last edited by SMC0007; 01-09-2019 at 10:23 AM. Now you got Luka four years under contract and every big contract runs out next summer or in 2020, thats a great situation to build around Luka. Last edited by sefant77; 01-09-2019 at 10:43 AM. I think there are too many buyers unfortunately. And guys like Wes, Barnes, and DAJ just don't have much value. BUT...the FO seems to be better at trades than FA so we'll see. Too many buyers. Good teams looking to get better, some of them looking to make mentally unstable moves (like Houston trading four first rounders for Butler). Lots of fringe teams like us looking to solidify playoff position. And the Mavs have almost zero assets. Still, I think we need to trade offense for defense. Last edited by EricaLubarsky; 01-12-2019 at 06:25 PM. I do it for M. Bridges in a heartbeat. Josh Jackson probably too. But i dont think the Suns are offering either of them. Or they are trying to attach a Wes-Anderson swap. Magic? Not sure...could be Bamba if they are locked in to bring Vuje back. 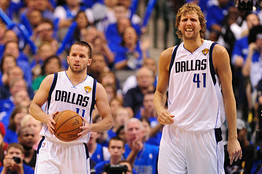 Losing Barea changes nothing -- we're still building beyond this season. If the right deal comes along, you call up Macon, play Wes more at the 2, and let Luka/Brunson/Harris split the ball-handling duties. I'm interested to see what they're offering, as both teams have plenty of promising young players who might fit in better here the same way DSJ might fit in better there... Or picks (although probably not). They’d have to add something to Bridges. I like him a lot but DSJ has upside that Bridges lacks. People aren't trading anything for Matthews when they know they can just sign him after a buyout. This is Deron Williams 2.0. Why would we do a buyout with Wes when we can just let him expire this summer? The only untouchable guys on this roster are Luka, Maxi and Brunson. Luka is obvious, and I think Maxi and Brunson are far more valuable to us than they would be to almost anyone else, so for practical purposes I don't think any of those three should be available for trades. My #1 goal between now and the start of next season should be to re-sign Kleber and leverage any of our other assets to try to find two-way wings that we think can be part of our next playoff team. I know a lot of people are aiming higher than Otto Porter Jr, but with out team's track record with elite free agents, I think OPJ would be a good, realistic target. If I could get him for either the widely-speculated Wes/Powell or Barnes straight-up, I do the deal in a second. I hesitate a little more if they're asking for DSJ or even DFS, because I know how important it is to have low-salaried, cost-controlled rotation players on your roster, but I would do Wes/DFS for OPJ if it came down to that. Another potential trade target I'd be super interested in is Mikal Bridges. I think he might end up having the 3rd or 4th-best career out of the entire 2018 draft class. He's already a good player, and I think he has 18ppg on 45/40/80 scoring with All-Defense potential. I flip DSJ for him in a second if that's the kind of deal Phoenix might be interested in. I agree there is value in protecting our 2019 offseason cap space/spending power, but I am still willing to take on 19/20 salary, even if it is for a less-than-perfect fit if it comes with another really good asset. I don't think any of Durant/Kawhi/Kyrie/Klay/Porzingis/Middleton/Tobias Harris signs here, so if I can get a solid rotation guy at the expense of dipping into our space this summer, I'm okay with that. With Luka here, I think we'd be fine making a significant trade and hitting a couple of doubles in free agency. If we can get any of those guys mentioned there though, I agree we should keep our space. But I don't think we'll be anywhere close to the top of any of their lists. Our future bench needs to be built on shooters, wing defenders, and bigs that can play the pick-and-roll effectively. In my ideal world, Luka and Maxi are our starters at PG and C next season, and the three guys in between are all probably not currently on the roster right now, unless Brunson makes a strong case to be the starter next to Luka in the backcourt by the start of next season. He requests it to join a contender? Mutual buyout interest? Mavs tried to trade him more than once? Don't even worry about it. I'm pretty sure that year 5 after an achilles tear is when a player reeeeally starts to round back into form. OPJ is cool and all but I'm much more interested in what Wash wants for Beal. Any non-Slovenian Wunderkind is on the block as far as I'm concerned. Beal would be to good to be true. It's obvious that getting Luka in the playoffs this year would be huge. The questions simply becomes how much of your future you are willing to sacrifice for it. There are limited players on the market that would achieve both and we are unlikely to get them. And then there's the Otto Porter's and Tim Hardaway's of the world, that are an upgrade over Wes but overpaid for a complementary piece on a Luka led team. It seems like the FO is constantly looking, but will only pull the trigger on obvious no-brainers, which is the right approach here. In the end four to six additional playoff games this season won't affect Doncic's or the Mavs' future as much. So going "all in" this year could end up foolish. That said however, I would at least expect some minor deals for pieces that fit better or for "low risk / high reward" flyers. It's obvious that getting Luka in the playoffs this year would be huge. Dont think its that important, specially if it would be a trashing against the Warriors. Last edited by sefant77; 01-14-2019 at 08:03 AM. Agree that making the playoffs this year is truly pointless. This years team will look nothing like the one we have in 4 years. Making the ASG would be huge for Luka. If he makes a few shots and then gets a lot of assists to fun dunks/open threes, I would hope that would make him able to draw other players to Dallas to play with him. Agree All-Star game over Playoffs. Anyone still have any interest in Aaron Gordon? He's kind of overpaid like Otto, only younger with maybe more upside. OPJ is playing great btw, without Wall. I was all about chasing Aaron Gordon as a RFA last summer and would still love to have him... His offensive numbers have regressed a bit this season -- PPG, FGA, FTA, 3PA are down despite his MPG going up, but his 3P%, FT%, and AST have gone up, which seems to indicate that he's comfortable as more of a role player on the offensive end. And even though his scoring average is down, he can still put up points -- he has 20+ in 10 of the 41 games he's played this season, including a 31 point game. That still puts him ahead of Dennis or Wes as a #3 scorer... But it's not his offense that I want, it's his defense. Big or quick, paint to perimeter, he can handle it all (watch: LeBron, Giannis, Kemba). I'd definitely look at Gordon over a guy like Porter.... Especially if we ended up trading DSJ, since we'd still be getting those high-flying dunks. Last edited by Underdog; 01-14-2019 at 03:01 PM. Just doesn't seem like a lot of teams want to sell. Orlando seems hell bent on being relevant. They seem like the idea trade partner, but nothing really seems to be stewing. I'd like multiple players on their team, but we really have no idea what an asking price for be for any of them. Don't think we are going to hear or see much until much closer to the deadline. Good stuff UD, had forgotten about his descending contract. I agree about his defense and he still has room to grow offensively, whereas a guy like Porter is probably close to topped out (though he seems to be handling the increased usage post-Wall just fine). And they are playing Gordon out of position at the 3 a lot due to a glut of bigs and would imagine they want Isaac as the 4 of the future. I would LOVE to somehow swing a Bamba/Gordon for DSJ/Barnes/filler trade. Barnes value is just low as he's a likely opt out. We could take back Simmons but he has one year 6m left so not so onerous. Adding Wes and Mozgov means we lose 16m for FA. Would've loved to see them throw $ at Gordon in RFA too. Bet they had gotten word that Orlando was going to match. Oh man, I'd eat Mozgov for a year to get a core of Luka/Gordon/Bamba, no hesitation... That's worth pushing off our FA pursuits until 2020, especially since that core is far more likely to attract FAs than Luka/Barnes/whatever. Agreed. I like what another poster said that Otto (as expensive as he is) is a realistic target. Really interested to see how this plays out, but I havent been this excited about the (potential) future since 2011. I cant imagine Wes would be brought back especially considering he hasnt closed out the last two games in crunch time. Hes a great guy and a great teammate but he'd be better off playing with a contender off the bench. If things stay the way they are with DJ, Id be surprised if the Mavs didnt make a push to re sign him. I'm sure the Wizards would jump all over that deal. Someone had written an article a while back that had a good theory imo. It was Washington Dallas Orlando 3 team. Where we give orlando DSJ. Orlando gives Washington Isaac. Washington gives us Beal. That was the main part but obviously Washington got more. Like maybe we take Mozgov from Orlando, Orlando then sends OKC 2020 pick to Washington instead of us. One of either us or orlando take Howard off The wizards and the Wiz get DFS or Kleber as a role player. I don't remember it all but there are options that would allow for a 3 team deal with Washington and Orlando IMO. Edit- Maybe Vuc was also sent to Washington. I can't remember. But yeah, the dream in't dead yet. Last edited by Bryan_Wilson; 01-14-2019 at 07:36 PM. I love Beal, but that's a bit steep. Last edited by Underdog; 01-14-2019 at 08:32 PM. Yeah that was it. Could make some slight alterations but I'd do it personally.